Kevin Durant accepted a big discount this past summer to help the Golden State Warriors’ keep their core together. While Durant says he doesn’t know what will happen yet, he just dropped a huge hint that he will re-sign with the Warriors and it could come with another big discount if needed. Durant has one year and $US26.3 million left on his current deal, but he can opt out this summer and sign a new contract. If he did, Durant would eligible to sign a 4-year, max-level contract that could come with a $US10 million raise next season and would be worth in the neighbourhood of $US160 million overall. Durant was then asked about taking another discount to help keep the key pieces together. Durant signed a contract this past summer for about $US9.5 million less than he was eligible and seemed more than willing to take another discount. Of course, the easiest thing to do in the near future is for Durant to just play next season under the current contract, essentially giving the Warriors another approximately $US10 million discount for next season. He could then see what the team needs in the summer of 2019. 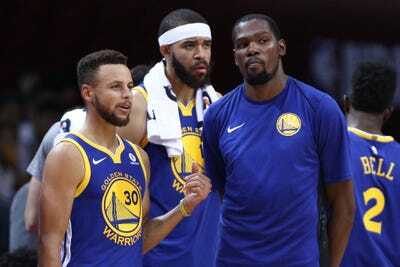 After the Warriors handed out $US334 million in contracts this past summer, even with Durant’s discount, they have about $US125 million committed to just their top six players for the 2018-19 season. That total alone puts them, not only above the projected salary cap of $US102 million, but also above the projected luxury-tax level of $US124 million with half their roster still needing to be filled out.